The story follows the life of its author, Terry Bisson, from the perspective of his protagonist, Clay. Both were born and raised in Owensboro, Kentucky, and grew up in the post-WWII era of prosperity and new thought. Clay learns truths about life and love through lifelong friendships, despite his own transience, and these lessons, recollections, and plot developments are structured into short, chronological anecdotes just a few paragraphs in length. As a youth, Clay becomes involved with a beatnik known as Roads, who invites Clay and his friends to listen to jazz and take turns reading Kerouac’s On the Road in his home. Roads says he dropped out of Columbia University “to get an education,” and Clay drops out of his institution, Gideon, in Minnesota, to do the same. Clay makes new friends and develops sexual relations with a roommate nicknamed EmCee. When their relationship ends abruptly amidst catastrophe and controversy, Clay heads to the Southwest to join a group of hippies. Their commune is self-sufficient in its cultivation of both food crops and marijuana, and concerned with, yet distanced from, political developments, wars, assassinations, and peace movements. He lives with long-haired versions of his childhood and college friends, as well as some new characters, including a horse named Color TV and a prom-dress-clad man named Dove. Although readers may have trouble keeping track of all of the characters’ nicknames, Bisson’s ability to accentuate their idiosyncrasies is impressive. Ties to the past are not limited to those around him, however; unanswered letters from his cynical, nagging mother and memories of EmCee haunt him yet are his most treasured possessions. As Clay loses and reunites with people from his past, the commune is subject to violence and territorial disputes of both local and national scope. Although the connections that follow and support Clay throughout the novel can seem too coincidental at times, their recurrences demonstrate the significance of not only the people, but of their ideas. 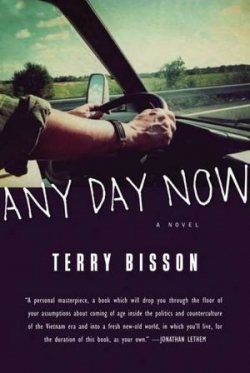 Terry Bisson is especially known for his sci-fi works and is the author of the Hugo-winning short story “Bears Discover Fire.” Those interested in American social and political history, the Beats, and sociology will find this portrait an artistic, authentic rendering of life across America in the mid-twentieth century. In the beginning, Clay seems destined to become a Holden Caulfield, but he quickly comes of age. From there, the focus of the story broadens to chronicle an entire subculture.